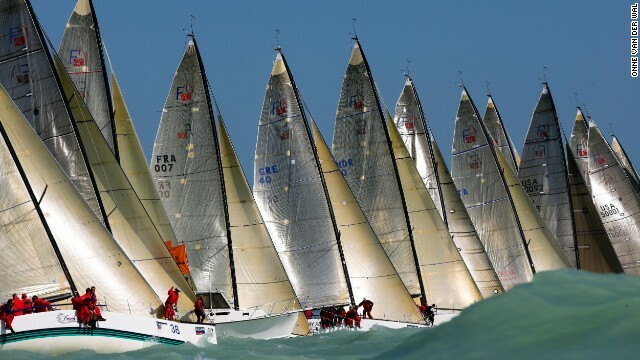 ONNE VAN DER WAL & "SAILING"
February, February 7 - 2014 7-9 p.m.
Master sailing photographer, Onne van der Wal, has seen incredible innovations and new technologies emerge during almost 30 years shooting sailing and yacht races. In an interview with CNN just last week, he describes himself as an "astronaut of the sea." It's more like space travel and I love it." Modern day yachts, particularly those for races such as the America's Cup, have taken advantage of materials such as carbon fiber and Kevlar used on the International Space Station and the Space Shuttle orbiter. The resulting vessels are significantly different from the more classic sail boats of just a decade ago. "The sails are laminated, made of carbon or Kevlar, have perfect shape, keep their shape for longer periods of time, have a wider wind range and most importantly are much lighter and easier to handle." Onne's newest book - "Sailing" - published just this past October by Rizzoli Press, documents these changes. The book is a stunner - a 11" x 14" hardcover with over 300 pages and many fantastic double page spreads, which show off his images beautifully. "It's wonderful to have such a high quality book to show Onne's work" says FOCUS gallery owner, Cindy Vallino. "As we represent Onne's limited edition print collection, it's a great way to highlight some of his best images. This is a must-have for every collector of photographic books, and really for anyone who loves looking at beautiful images of the sea. And isn't that all of us?" The book signing and exhibit on February 7 at FOCUS Gallery is a public event. Admission is free. For further details, call the gallery at 781.383.0663.